Just like the famous Machu Picchu peak in South America, I thought! Though it was 5 am, it was already bright outside. From the balcony of my room, I was staring at three giant peaks! In comparison, the village below seemed tiny! After a moment, I could also hear the sound of a water fall from a far distance. I could spot a stream on the mountain. But wait, not one but many such streams. As I turned to my left, I saw a sparkling spectacle! Peaks of snow capped mountains glowing like gold in the sunlight! Wow, I felt like I was being welcomed to Lachung in North Sikkim. As I was contemplating, I remembered what my guide said, "It was just the beginning!". But what could be a greater sight than this? Well, after an hour, we were on our way to find out. We felt blessed as we crossed a bridge decorated with Tibetan prayer flags of blue, white, red, green and yellow. How does closing of a Kannada medium school in Kasaragodu in Kerala bordering Karnataka, matter to mainstream Kannadiga audience? Well, it does matter, if you go by the cheerful full house crowd on a weekday, clapping and blowing whistles at every opportunity! When at the end, the stars of the movie appeared in the movie hall – it was an ecstatic atmosphere. The film opens with children back in the Sarkari Hiriya Prathamika Shaale (Govt Higher Primary School), Kasaragodu, after spending leisure time during holidays. Mischievous Mahendra, Dadda Praveen who has a crush on Pallavi, Innocent Mammootty with his miserly father portray beautiful childhood. With green and scenic coastal background and a potpourri of Kannada, Tulu and Malayalee cultures bring out rich visuals. 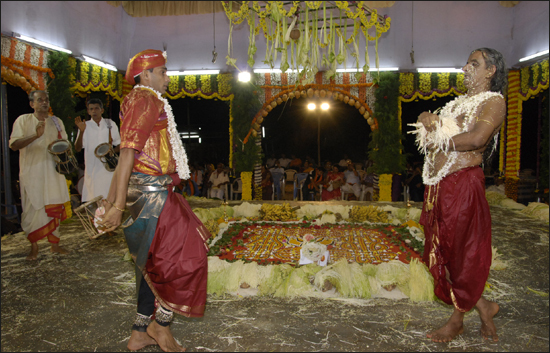 In addition, it is delightful to hear different dialects of Kannada along with the Kannada dialect of Kasaragodu. Vasuki Vaibhav’s music strikes the right chord both in peppy Dadda song and in classical rendition of Hey Sharade. Moreover, touch of humor in every scene makes the movie thoroughly enjoyable and is more than enough to make us nostalgic. In the meantime, when the funds are not get allocated for school repairs, teachers are not paid on time and when the linguistic minority school is overlooked for government schemes troubles begin in the paradisaical setting. It reaches a point, when the school has to be closed, citing poor student strength. How the school is reopened form rest of the story. Telling a serious issue in a humorous way is a challenge. Director Rishab Shetty has succeeded very well in that throughout the movie. Even when the story takes predictable twists towards the climax with themes of corruption and self-interests, humor keeps it going. Rishab has also touched a sensitive linguistic issue without verbal bashing. Kudos on that. Coming back to the question, I asked in the beginning – how closing of Kannada medium schools outside Karnataka matter to Kannadigas? It matters because it is the state of affairs in Karnataka as well, where Kannada medium schools are closed, due to poor student strength. This film does not delve deep into the reasons but it does create awareness. Looking for reasons - is it because of the mushrooming English medium schools, which is because we don’t have jobs for people who studied in Kannada medium, which is because we with our policies, have created a feudal and corrupt system as such.